i like to think of this colour combination as raspberries and wine. not quite strawberries and champagne, but ... .
i am wearing the architect shirt, the brasilia dress and the tokyo hat by kaliyana. my pullover is by grizas. i am wearing the rectangle boot (closed collection) by trippen. I love this colour on you!!! thank you, karen. thank you, sue. i am sure i am repeating myself when i say that my favourite colours are from the red family. 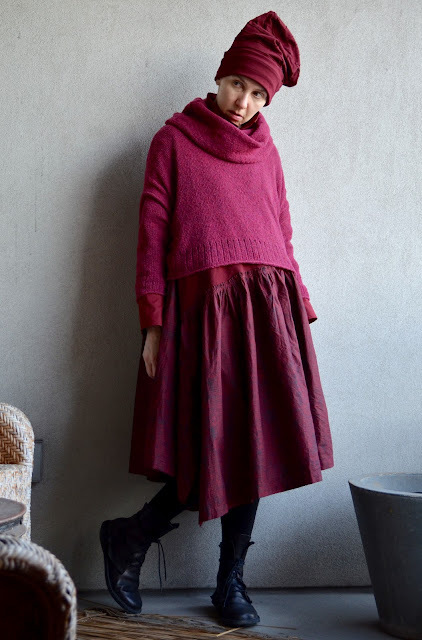 in fact, i just purchased several pieces from the rundholz s/s 2016 collection in strawberry. i am so looking forward to wearing them! luckily, while the pieces are not made of winter weight fabric, they also aren't made of what i would say is summer weight fabric. they are made of fabric that is substantial enough that they will be great transition weather pieces. repeating myself: i am so looking forward to wearing them!